Luxury 3-bedroom cottage sleeping up to 6, with access to onsite facilities. Deer View Cottage has recently been fully refurbished into a luxury five-star property, which can comfortably accommodate up to six in three bedrooms, including two doubles, which can be made into twins if required, and a single divan with a further pull out single. The dog friendly cottage is nicely located on the edge of the Highbullen estate and therefore enjoys some wonderful views over the local countryside. The cottage is also only a short walk from the onsite leisure facilities, including an indoor heated swimming pool, a gym, an 18-hole golf course and six all-weather tennis courts, many of which are included in the price of the cottage. Deer View Cottage has a bright, spacious living area with stunning views of the countryside all the way to Exmoor. Overlooking the garden and the views beyond is a large comfy sofa and and an arm-chair where you can relax, watch the TV or admire the views. Just outside the lounge is a small balcony that overlooks the garden. In the centre of the room is is a smart pine table and seating for up 6 people; beyond that is a very well equipped kitchen, with everything you need to cook great family meals. Included in the kitchen is a fridge, a separate freezer, a dishwasher, a washer/dryer and an electric oven. The first of the main bedrooms at Deer View is a lovely large double with handy zip and link beds allowing it to be made up as a twin if required. The tastefully decorated room continues the countryside theme laid out throughout the cottage with a gorgeous brown suede headboard being one of its many striking features. The double aspect bedroom has lovely countryside views that are best captured by early risers. Other benefits for guests include a wall-mounted TV and a large built-in wardrobe. The second bedroom has a single divan with a pull out single. The Master Bedroom at Deer View Cottage has some of the best views thanks to its large window that looks out over the local countryside. At the heart of the bedroom is the king-size double bed, which can be separated into two singles if required. There is also a large built-in wardrobe, a wall-mounted TV and a handy desk for any guests looking to do some work during their stay. The Master Bedroom also benefits from its own en-suite bathroom, which has been fitted with a walk-in shower, a loo and a wash-hand basin. Please note Deer View does not have its own private garden, however there are plenty of lawned areas around the cottage, which guests are welcome to take advantage of. There are two bathrooms at the cottage, these include the following: Bathroom 1: Located next door to Bedroom 1 is the main family bathroom. The spacious bathroom has everything you need, including a massive bath with hand-held shower attachment, a separate corner shower, a large wash-hand basin and a loo. Bathroom 2: The Master Bedroom benefits from its own en-suite bathroom, which has been fitted with a walk-in shower, a loo and a wash-hand basin. A luxury three bedroom pet friendly holiday cottage in an excellent location. This stunning, recently refurbished property is perfect for couples or families looking to enjoy a holiday in the North Devon countryside. Guests can also take advantage of the amazing onsite leisure facilities, many of which are available free of charge. Thank you so much for taking the time to write this lovely review - we are glad you enjoyed your stay on North Devon - it certainly looks like you had a good and healthy time! Of course we would be delighted to welcome you back, when you should remind us to give you details of some lovely places to eat such as the Rising Sun in Umberleigh, The Bell in Chittlehampton or The Corn Dolly in South Molton. I assume you managed a meal at the Exeter Inn and sorry we do';t have more establishments within walking distance! Thanks again and I'm glad you have returned home with some happy memories of your holiday in North Devon. Do come again! 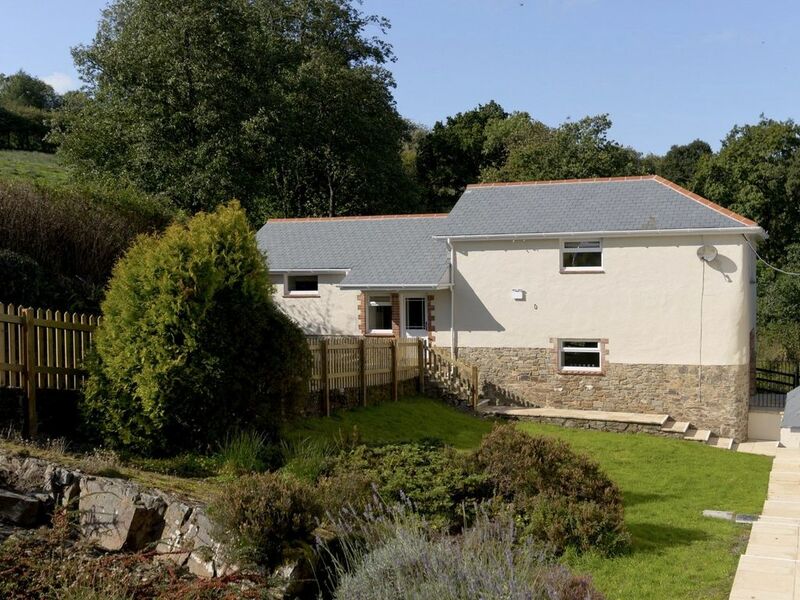 Deer View Cottage is ideally located for exploring both the coast and countryside of North Devon with Exmoor and the glorious sandy beaches all within easy reach. The lovely North Devon coast is about 30 minutes away, with the sandy beaches at Saunton Sands and Woolacombe Bay in one direction and Westward Ho! in the other. There are also smaller coves and beaches to discover, including those at Hartland, Instow, Appledore and Lee. Exmoor National Park is also nearby and well worth a visit with its beautiful rugged landscape and traditional tea rooms that serve wonderful cream teas. Stop off at Lynton and Lynmouth where Exmoor meets the sea and savour some of the locally caught fish in one of the restaurants. Deer View Cottage is located on the Highbullen Hotel, Golf and Country Club Estate and guests can take advantage of the onsite leisure facilities, as well as enjoy meals in the restaurant. Facilities onsite include an excellent 18-hole golf course, all weather tennis courts, an indoor heated swimming pool, a billiards room and a gym. If staying during the warmer months enquire about enjoying afternoon tea within the grounds. Highbullen is situated within the pretty countryside village of Chittlehamholt, which has its own pub, The Exeter Inn, and a small village shop selling daily essentials. There are many walks that can be enjoyed locally, as well as safe routes for cyclists. Stables for horse riding are also within easy reach.